The left’s seizure of academia in America as the means by which to brainwash the next and subsequent generations of this nation has proven to have been quite successful. They are largely a group of young, naive, know-nothings pretending to have a factual basis for their opinions when they are simply regurgitating the false generalizations and stereotypes they’ve been fed. 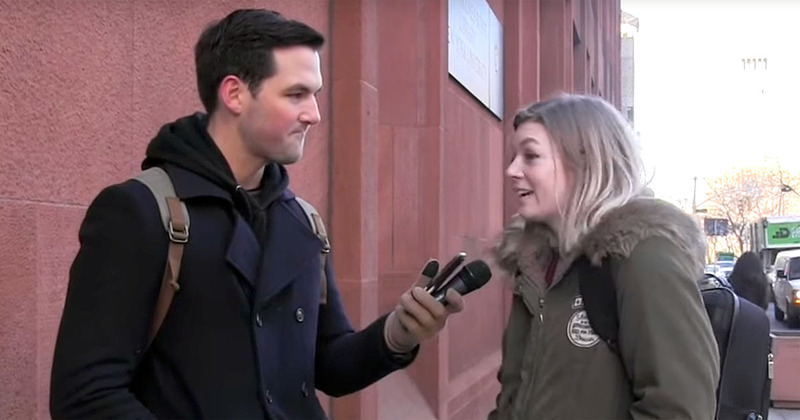 Campus Reform once again exposed this reality by asking a group of college students at New York University about the content of President Trump’s State of the Union address, which the interviewer stated took place the evening before. As bad as it is that none of them knew when the speech is to take place, it’s much worse that none of them would admit that they hadn’t seen it and chose to simply agree with the premise of the question and pretend that they were informed. It’s more of the same process that takes place in the libtard classrooms and what they hear in the anti-Trump media, their conditioning involves consuming and then spewing back out the ideas of others while repackaging them to make them sound as if they are their own. Truthfulness or critical thinking are not part of the means by which they arrive at their positions. One nasally libtard who was asked for her opinion of the State of the Union replied, “I didn’t watch it because I couldn’t bring myself to watch it.” Another said it was “quite racist at the very least, if not up there with most racist.” Their indoctrinations are obviously complete to the point of instilling extra-sensory perception. One woman is asked about her thoughts on accusations that the message is being shut down “just because it’s Trump saying it. She reveals her own hypocrisy, ignorance and dishonesty as she replies, “I don’t think so. I think there are enough progressive and intellectual people [elites] that really analyze what he’s saying.” Really analyze, huh? The desire to sound intelligent when a microphone is shoved in front of their faces and an unwillingness to admit that they are uninformed surely played a role in their attempting to BS their ways through the interviews. But they’ve all obviously been fed the same crap, that President Trump is an evil racist for wanting to protect the United States from being conquered. They’re the best of America’s good little Bolsheviks, the pretentious useful idiots that make the globalist Democrat overthrow of this nation and another Civil War a real possibility. I think going out and telling these impressionable idiots false things only makes it harder for DJT, UNLESS he told them in the end that they were punked. I can just see them running and telling their lib friends all these lies. Not good. Spot on! They are useful idiots indoctrinated by the Department of Uneducation, better, Department of Indoctrination. DeVos has done nothing to stop this system. We are still funding the “schools” for Alinskyites, still have unions, still have job security just like the corrupticians. The DoE is an appendage of thh swamp and makes sure little followers are molded to follow the beat. and i AGREE with you Ben. and those parents are just WASTING THEIR MONEY on those USELESS EATERS NONE EDUCATION. The “molding” began almost sixty years ago and now dominates all of education. The pendulum needs to swing the other way. But, the reversal will take many years. We won’t see it.